You’re pumped and ready to start blogging. Your goal is to create financial freedom and live life on your terms. Who isn’t? Today I’m going to provide you with the ultimate guide to Google Analytics for beginners. In this tutorial, I’m going to show you which reports I pay attention to and tell you why it’s important to start paying attention to your blog metrics. Google Analytics is nothing more than a way to measure the metrics of your blog. You embed some code into your blog and you can then start seeing what people are doing on your blog, how they found you, your site referrals and so much more. Without tracking your blog visitors, you’d be blind and wouldn’t know what’s actually working. The great thing is that it is completely free to use and every blogger should be using these metrics to tweak their content writing, marketing methods and so much more. This is my unofficial meaning of it and if you want to read a more in-depth meaning, read this. When Should I Add Google Analytics To WordPress? Even if you’re just starting your WordPress blog, you need to add the Google Analytics embed code today. Stop what you’re doing and read my tutorial on how to setup Google Analytics on WordPress. Don’t forget to remove yourself from your analytics, otherwise you’ll be tracking your own visits to your blog. I know what you’re thinking, I’m NOT getting any traffic. The only people who are visiting my blog are my friends and family. So why the heck should I bother adding this to my blog? While it’s true, it’s going to take some time to grow your blog. There’s no way around that and I’m not going to try to sugar coat it. Anyone who tells you that your blog will be profitable in a month, is lying. However, without tracking your metrics you are flying blind. You won’t know which marketing methods are actually working. Basically, it’s kind of like playing darts in a dark room. You know there’s a dart board and your goal is to get bullseye. However, you can’t see the board, so you keep throwing the darts hoping one of them will hit it. Without tracking your marketing efforts, you’ll never know where you should actually be spending your time. You’ll end up trying different methods and will never know which one is actually working. My last several blogs I never took the time to learn how to use Google Analytics. I didn’t think it was important enough and my main goal was just to keep pumping out content. Boy was I wrong. I have to admit, I am not a Google Analytics expert, there are tons of people that can teach you a lot more than I can. However, I am sharing how I personally use Google Analytics for my own blog. I am going to share with you which reports I focus on to show me how I can improve my blog. If I don’t cover the reports in this guide, that means that I don’t currently use it for my own blog. If you haven’t started blogging yet, here is my tutorial on getting your blog started. As a “thank you” for purchasing through my affiliate link, I’ll send you a copy of my book – The Jumpstart WordPress Guide – for free. You can choose to use Google Analytics anyway you want. I’m just sharing what I focus on. I don’t want you to spend time trying to grow your blog, only to realize that you don’t know where your traffic is coming from. After months of doing the same thing over and over, you finally start to see some results. You’re even lucky enough to make your first affiliate sale. You would like to duplicate that marketing method that made your blog money. The only thing is that you have no clue where that traffic came from. You never took the time to setup Google Analytics. Basically, you were just throwing spaghetti at the wall to see what sticks. There’s nothing wrong with throwing spaghetti at the wall to see what works and what doesn’t. We all do it. The important thing is that we need to keep track of our hard work so we can see what’s actually working and what isn’t. So don’t make the same mistake I made in the past. I want you to succeed online so you don’t work harder than you have to. I know that Google Analytics can be confusing for bloggers who have never used it. That’s why I am going to login into my account and break it down for you. My hope is that this Google Analytics walkthrough will help you understand how to use Google Analytics. As a blogger, it’s important to learn how to use this free software to help you monitor your blog’s performance. This is going to be an extremely long post, so I am going to add jump tags to it. You can use the links below to jump to the section you need help with. I am only going to show you which reports I focus on that I’m using to help me improve my blog. Feel free to focus and learn more about all the other reports that I don’t cover in this ultimate guide to Google Analytics. If you have already setup your account, you will be able to login. As soon as you do, you’re going to see this. This is my overview traffic stats from March 1, 2017 – March 28,2017. If you’re new to Google Analytics this can be extremely confusing. What the heck does all this mean? Don’t worry, we’re going to run you through the tabs that I use. Then I’ll also point you to a couple of sources you can use to get a more in-depth education on Google Analytics. To tell you the truth, the only tab that I use in this section is the Custom Reports tab. Here’s what mine looks like. As you can see I have custom reports set up for Facebook, Pinterest and Twitter. To tell you the truth, I haven’t spent a lot of time analyzing the information from these tabs. I know, I know, shame on me. Take a look at what these custom reports will show me. I can then use the information from the reports to improve the content on my blog. That’s actually one of the reasons, I’m writing this ultimate guide to Google Analytics. After reading my reports, I realized that people loved my Google Analytics blog posts. So maybe I’ll take some time this weekend and actually read these reports. If you’re wondering where I got these reports. I got them when I joined the Pinning Perfect course. It’s definitely worth it if you need help using Pinterest to grow your traffic. Real-Time: This tab will show you how many visitors are actually on your blog right now. If someone is on your blog, it will tell you where they’re from and who referred them. I’m kind of embarrassed, there’s only 1 visitor on my blog right now. Oh well, I am working on growing my blog traffic. Slow and steady wins the race. So let me run you through the information on this visitor. Device: They are viewing my blog from a desktop computer. Top Locations: They are from the United States and reside in Ashburn. Many people say that you can no longer see which keywords people typed into Google to find your blog. I’ve found a great tutorial that will walk you through on finding out the information Google doesn’t want you to know, read this. I’ve already set mine up and it’s amazing to see what people are typing into Google to find your blog. My blog is still fairly new so I’m not getting a ton of search engine traffic. However, as my blog continues to grow, eventually, more people will find me based on long tail keywords. That’s why it’s important to make sure you’re writing content based on keywords people actually search for. I use this for my keyword tool. This tab will give you an overview of your traffic for your WordPress blog. You have the option of creating a custom date range or you can see the last 30 days. You can see from my report, my traffic is consistently low, which is normal for a newer blog. I’ve started using this traffic ebook to help me implement some new traffic methods. Hopefully, I’ll start to see some traffic growth soon. Although, I’m NOT interested in just any traffic. I want targeted traffic. People who are actually interested in what I have to say. Most of my visitors are people who have never been to my blog. This is why it’s important to start creating an email list. People who find your blog may never return again. You need to give them the opportunity to subscribe to your blog. This is why I’ve created my free 7 day blogging course. If you haven’t set up an email opt-in, then you may want to consider doing it today. I love looking at this tab. As long as I see a continuous growth, that means that your marketing strategies are starting to work. You can read more about how the active tab works. As long as you see a continual growth, you’re on the right track. You can’t expect to grow your blog traffic overnight. It takes time to see results. I’m not a traffic queen, as I mentioned, I just throw spaghetti at the wall to see what works. I’ve also picked up this traffic book that I’ve started implementing. This report will show you what type of devices people are accessing your blog from. You will only look at the overview here. As your blog starts to get traffic, you’ll start to notice a repeating trend. More and more people will be accessing your blog via their mobile devices. This is why it’s extremely important to make sure that you’re theme is mobile friendly. If you’re still looking for a mobile friendly WordPress theme, I use the Genesis Framework. This tab will show you a lot of data in terms of where your visitors have come from. The overview can be extremely confusing. I don’t use that portion very much. I tend to use the channel section of this report tab. The channels will break down your traffic from social, direct, referrals, organic and email. I focus on the following channels to help me get more information about my blog. Social: This channel is going to break down the social networks, and the visitors that visit your website from Facebook, Pinterest, Twitter and Instagram. Direct: This will show you how many people who access your site by typing in the direct URL into their browser. Organic Search: This report shows you the searches done in a search engine. When your blog starts to rank for certain keywords or phrases, eventually, people will start finding you when they type in certain terms. This is why it’s so important to write content based on keywords people are actually typing into their browsers. I use this keyword tool to help me with my content creation. Referrals: Other websites that link to your website and have actually sent you visitors. As you can see from the image above, these are the some of the sites that my blog has links on. Whenever someone lands on my blog from these sites, Google shows it as a referral from my website in this source. In my opinion, this portion of the guide to Google Analytics is extremely vital. While the other sections are important as well. This part will help you understand what your visitors are looking at on your blog. You’ll want to look at all the pages and landing pages they are visiting. This will help you determine what your audience deems important and wants more information on. All Pages: These are the pages that people find interesting on your blog. When you’re first starting your blog, you are just writing content you believe your avatar will love. You can’t really know for sure what they will love. As you continue writing more awesome content, you’ll start to see what your visitors love. You can then use this information to write more content based off of your most popular pages. For instance, if I notice that people love my blog post on how to motivate yourself for blogging. I could then start creating more content based off of that one blog post. Be sure to use these metrics to help you improve your blog. Using this technique will also help you improve your bounce rate. Landing Pages: This report will show you which pages your visitors are landing on and they are seeing first. These pages are the first pages that your visitors have an interaction with. You can use this page to determine 2 things. What are your most popular pages on your site (once they land on your blog). This will also show you which pages are the most popular and are driving the most traffic to your blog. As you can see, I can literally go through all this information and write more content based off my most popular pages. Sorry, I blurred it out so I don’t reveal everything about my Analytics. This is a more advanced feature and you will need to create one and set up the widgets that you want. It took me a while to figure out how to do this, however, I love it. The dashboards will give you a quick glance at the stats that you want to see. The beauty of it is that you can choose what stats are important to you. I love this feature and have been using it to keep track of my goal conversions, traffic sources, bounce rate, and so many other metrics that will help me grow my blog. Since using this feature, I have found it extremely useful to keep my metrics nice, clean and in one spot so the are easy to view. Once you create your dashboard, you can then setup an automatic email to see how your blog is growing over time. I love emailing myself monthly reports so I can see how my blog is growing with time. If you haven’t set up a dashboard, let me walk you through the process. This will be a quick walk through tutorial, so follow along. You will have the option to choose a blank dashboard or a starter dashboard. If you’re brand new then I recommend getting the starter dashboard set up. This dashboard will look like this. So let’s run through what the starter dashboard shows you. If you want to know what each of these terms mean here’s a glossary you can use. Dashboards are powerful I love using them now that I understand them a little bit more. Once your blog starts growing you may want to start paying attention to your goals and conversions. These types of reports will show you how well your opt-ins are performing. You can literally set up any type of conversion in Google Analytics. If you do any type of guest posting then chances are you may link to a landing page. You can set up goals to see how well those landing pages are converting. I’m still working on improving my own conversions…so stay tuned on my personal experience and struggles. So as soon as you feel comfortable and ready to pay more attention to the analytics on your blog, let’s set you up a custom dashboard. If you’re ready, then click the blue box below to watch over my shoulder as I walk you through the entire process step-by-step. If you’re a DIY blogger like I am, then you need to continue educating yourself. You can use sites like YouTube, Lynda, and Udemy. If you really wanted to dig deeper and become an expert, you can consider finding out more about the Google Analytics Academy. I’ve personally never taken the free courses, as I always have so much to do on my plate. I don’t have the time to fit anything else. Plus I figure as long as I understand how to use it to help me see how my blog is doing, I’ll be fine. If you do decide to take it, just know that I’ve heard the Google Analytics Academy answers are not very easy to find online. Instead of focusing on getting everything right, make sure that you’re taking the time to understand how the platform works. There is no shortage of sites and resources that will help you learn more about using Google Analytics. You don’t have to know everything to get started. The important thing is just to add it to your blog. You can always learn new things as you continue growing your blog. Hopefully, this ultimate guide to Google Analytics for beginners made you realize how easy and important it is to start tracking your visitors. Without this knowledge, you’ll never know which marketing methods are actually working for your blog’s growth. If you still haven’t set up Google Analytics on your blog, then now is the time to do it. You want to be sure that you’re ready to start tracking where your visitors are coming from as soon as you get traffic. Without this information, you’re going to struggle. I refused to learn about analytics and metrics with my past blogs. Don’t make the same mistake. Track everything that way you know what you’re doing and what’s actually working. Growing a blog takes time and a lot of hard work. Don’t listen to anyone who tells you otherwise. If you need some traffic generation ideas, check out this traffic guide. Are you using Google Analytics to track the growth of your WordPress blog? How often do you find yourself checking your daily traffic stats? Maybe you know something that I forgot to mention in the guide. If so feel free to add value to this post by commenting below. Wow, lots of value here. Way to share and help us be unstoppable with our sites! Glad you enjoyed, that’s my goal to provide quality articles people. Thanks for this. I am also willing to write a blog as well and this article is really going to help me a lot. Thanks again for this post. I am glad that you found it helpful. Hope it helps you learn how to track the metrics to improve your blog. Don’t get too caught up in metrics though, just focus on what’s actually working for your blog. Very informative article Susan. I am bookmarking this page for future reference as well. Even though I have implemented analytics on my blog for quite some time now, there is always so much to learn about the tool and the various features it offers. Glad you found it helpful. I know what you mean about so much to learn about using Google Analytics. It seems like I am always learning something new. Hi Susan. Thanks for sharing how you use Google Analytics. I’m nowhere near an expert either. There is so much information available there. I keep it simple so far. I check my dashboard every day to see how I did yesterday compared to previous days. I did figure out how to apply a filter so that I see only my target audience. Then I look at Behavior->Site Content->All Pages to see what pages are getting the most traffic. I look at the pages that get the most traffic to see how I can get them to convert to sales better. I look at the pages that get less traffic to see if there is something I can do to increase their traffic. I know what you mean about checking your stats on a daily basis. I am trying to stop doing that because I fell like it just wastes too much of my time. Seems like you know your way around Google Analytics pretty well. I’ve also started looking at which pages are getting the most traffic so I can create more content around them. Thanks for sharing your strategies on how you’re using Google Analytics. Hey Buddy!, I found this information for you: "Ultimate Guide to Google Analytics For Beginners WalkThrough". 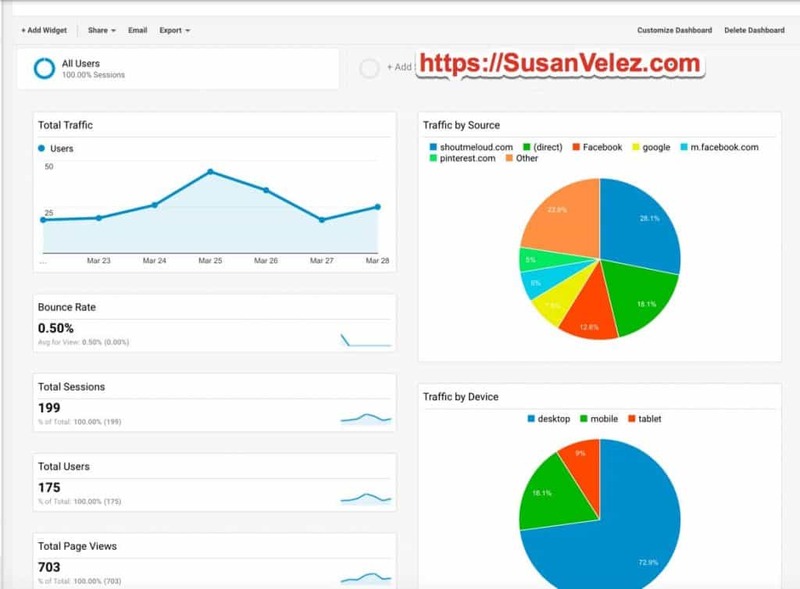 Here is the website link: https://susanvelez.com/guide-to-google-analytics/. Thank you.